I generally like to put up blog posts that talk about cool things I’ve discovered on my Mac, or problems I’ve overcome and how I did that. 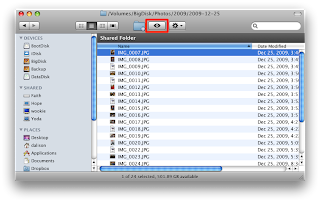 This time it’s about a pet peeve I have with my Mac: quickly viewing a group of images. I believe there is a tiny change Apple can make that would have a huge impact on usability, especially for non-technical users. Preview is a very cool part of OS X. Small and light, I can load lots of different files and off I go, scanning through them quickly. As a technical person I appreciate the way it works when viewing a group of files; I select them, pop-up the context menu (Right Click for me) and select Open. Preview loads them up and off I go. I can happily navigate through the selection or throw together a quick slideshow from the Preview menu. Where this breaks down is for the non-tech user. My wife was looking through a large collection of images this morning on a shared drive that I have. She navigates to Force (my Mac Pro), selects a shared Photos folder, then navigates down to the folder of images she wants to see. So far so good. The first thing she does is double-click on an image, which loads it up into Preview. This is a natural act for virtually any non-technical person; you see a file you want to view and you double-click on it. Great! Then she wants to see the next image. The navigation within Preview doesn’t work because by double-clicking on an image she has only selected a single image. It’s only if she has selected a group of files that Preview allows any navigation between those files. As a software developer with a UI background I understand the importance of having objects behave consistently. Select a group and perform an action on them. Got it. Where this breaks down in Preview is that non-technical users don’t grasp the concept of collecting a group of items and performing an action on them. By navigating to a folder they already have gone into a collection of items. Why should I then have to select all of those items before performing a group action on them? This is especially true with an application that is designed to help a user quickly scan through files without having to load a large app to see them. If I want my wife to use Preview to view all of the images in a folder I need to tell her to navigate to that folder, click on the first file in that folder to ensure it has focus, press Command-A to select all of the items (or click-drag the mouse on all of them), then press Command-O to open them. She does this once every month or so, not often enough that she’s going to remember it. Now she navigates to the folder, selects the file and clicks the little eyeball. Quick Look is even faster than preview but has a small problem: if I click the Full Screen button it loses the ability to navigate through the rest of the images. She uses a white MacBook so the screen is not very large; I told her to drag the Quick Look window to a larger size (it resets every time you switch to a different folder) so that she can see it better. An option I tried for her was to use the Cover Flow view. While it’s very obvious how to navigate, the small size of her MacBook screen and the large areas of screen real-estate used for navigation controls leaves some pretty tiny images. I use iPhoto on my Mac Pro and that’s what I use to browse my photo library. So why don’t I just have my wife use that? There are two options for her using iPhoto: the first involves her importing all of the images I take (and I take a lot) into her local copy of iPhoto. That’s far too much work when all she really wants to do is quickly browse through the last month of photos that have been taken. The second option is that I have iPhoto loaded on my Mac Pro and share the my collection. This presents two problems: sharing a 40K photo sized iPhoto library over a wireless connection is… S…L…O…W. It also means I have to have iPhoto loaded at all times on my Mac Pro in order for it to be accessible. Both are non-options for me. When I posted this little Pet Peeve on Twitter I got a couple of responses. @Eaglesdontflock suggested that I used a program called Phoenix Slides, a donation-ware application that puts up blazingly fast slide shows. I tried playing with Phoenix Slides and came away very impressed, so much so that it will be a different blog post in the next couple of days. If I load up a single file in Preview I would like the navigation controls to be enabled as though I had selected all of the files in a folder. Let me navigate through all of them. This is only true if I selected a single file. Too much? Then if I load up a single file in Preview, let the Slideshow feature work on all of the files in the folder. Seriously, why even offer the Slideshow option when only a single item is selected? Will this break a UI model? Well, it’s really only a change on a single application: Preview. It doesn’t imply that all applications need this behavior. Since the goal of Preview is to quickly and efficiently scan through files I would think this would be a great little change and in keeping with the purpose of the application. If it’s too much then make it an option in the Preview preferences. At this point I’d take a terminal hack to make it work that way! As always, if you have a suggestion for a better way to handle this please drop it into the comments below. I also encourage you to follow me on Twitter. Sure, you’ll get a lot of other non-Mac stuff but hopefully you’ll get some value out of it as well. A little late but couldn’t she just drag the folder onto the Preview icon in the dock?